Today, tourism is one of the most profitable sectors of the economy in Azerbaijan. Gabala is one of the most popular tourist destinations of the country. Tufandag is located four kilometers away from Gabala city. Over the past years tourism has rapidly developed in this region, and there are many opportunities for tourists. The city allows visitors to enjoy different extreme sports and tourism activities in the harmony with nature. 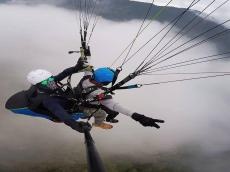 From the winter months of this year, Paraplane flights became another fun and extreme type of entertainment in Gabala. The region’s nature landscape and the ambiance make this place more favorable space for flights. Flights are carried out from Tufandag every day starting at 10 am and the flight duration is 10-15 minutes, said Alexander Makarov, the organizer of flights in Gabala. Moreover, Tufandag is the most favorite place of ski lovers in winter and also the ideal place for those who want to walk in the mountains, ride in a cable car to watch the nature and enjoy active rest in summer. There is more than 5-kilometer walking distance in the rope lines and 4 stations (points to stop). These are the L2 Riverside station with the height of 956m-1,660m, the L4 Gabala cable car track with the height of 1,251-1660m, the L5 Duruca cable car track with the height of 1,251-1,410m, and the L6 Sleeping Beauty cable car track with the height of 1,410-1,920 meters.